Hi girls! 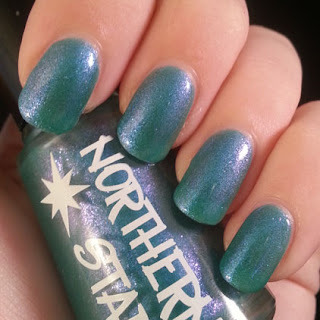 Welcome to part 2 of my Northern Star polish review! I'm very excited to show you the next three polishes that I received, I saved the best one for the very last of the show. In case you missed my review of the first two polishes, check it out HERE. To cut to the chase and just start buying every polish Northern Star has in her shop, click HERE, although the Halloween collection won't be available until September 15th at noon Central time. But you have a sneak preview of the gorgeous polishes that make up this collection, right here! Click 'read more' to continue! Twisted Treat is described as a black polish with orange shimmer. At first glance I'd just call it plain brown with shimmer. I'm SO glad I got to try this polish! I wouldn't ever have thought it would be my kind of polish because I don't usually wear dark colors, but it looks so sophisticated. The shimmer keeps my gaze drifting to my nails again and again, it's really gorgeous. The shimmer is like fire on my nails! Twisted Treat goes on smoothly and is opaque in two thin coats, you could even do it in one thick coat. Even clean up was a breeze, as far as I needed to clean up anything with this polish. I did add a top coat for shine. Excellent drying time, no bubbles, self-leveling and just a straight-up dream to apply. There's nothing else I can say! In the macro shot you can clearly see the orange shimmers. This is a very nice polish to admire from up close. WARNING: the danger of watching your nails all day while wearing this polish is a very real possibility! This is Pumpkinlicious. Now here's one that I didn't like so much. There's nothing wrong with the formula, it applies great, dries fast and doesn't bubble. I don't know what it is, I guess this is just not my color combination. I tried layering Pumpkinlicious over several different polishes but it came out best over Twisted Treat, as Kristin had suggested in the note that was included in my blogger package. Orange has never really been my color (go figure, my national color is orange) and these orange glitters are too crowded. There's also larger green and holo golden hex glitters that are more to my liking, and then also some holo sparkles that I like very much. Blurry pic alert! I really want to show you the prettiness of the holo glitters and the best way to do that is to trick my camera into taking a blurry pic. Poor camera, he really didn't want to do it, but I made him do it anyway. A little macro shot for your viewing pleasure, you can see all of the orange glitters on top of Twisted Treat, as well as the larger hex glitters in green and holo golden. You can also see the bubbleslessness (that's a new word I invented, feel free to practice pronouncing it) of Pumpkinlicious, or better yet you can't see it because you won't be able to spot any bubbles. Pumpkinlicious did have the perfect name to inspire some nail art. I drew a pumpkin on my accent nail but apparently it's not too obvious for Dutch people. Pumpkins aren't a big part of fall, at least not like they are in the US. So when I showed this to a couple of people, they thought it was some kind of leaf pattern, a turd and even 'organized chaos'. Well, the last person would be right in any case, I guess. Most people didn't get what the brown squigglies were doing there. Those are pumpkin branches, in case you didn't know either. I was trying to spice up my drawing and make it look less like something a kid would draw. Is the word pumpkin starting to look weird to you as well? 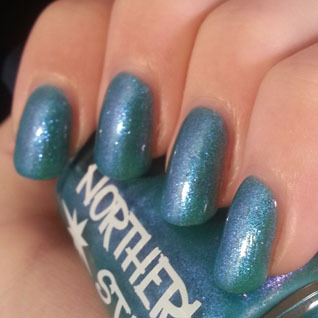 This gorgeous shifty polish is Phantasmagoric. It's a teal jelly with a shimmer that flashes blue/purple in different lighting. It took 5 coats to reach opacity but it was SO worth it! This is by far my favorite polish in of the five I got to review. Phantasmagoric is amazingly smooth, self-leveling, it looks beautiful and shiny and it keeps my eyes drifting towards the polish all day. I love the name too, by the way, it keeps a balance between ghosts and wizardry. I tried to add a nail art ghost but it was such a failure that I don't want to show you! Doesn't it look duochromey to you? I like it very much! You can also see sparkles in this picture, it's most visible on my index finger (in the background) because of the out-of-focus part of the picture. Five coats really matches the bottle color perfectly, but I like the shimmer better on the nail, it's more subtle and shiftier. Gaaaaahhhh prettiness! Look at how the shimmer shifts purple around the light reflection of the lamp, but blue in the upper left corner of the picture! It's so perfect! What's even better about Phantasmarogic is that it has so many possibilities... You can wear it on its own, or layered over another polish. I swear, I love this polish! Here I layered it over OPI Tomorrow Never Dies. It's a dark blue/purplish kind of color, Phantasmagoric makes it a bit lighter and adds the gorgeous shifty effect to it. I really really love this combo, it's very chique yet fun. Different layering combos will make the shimmer stand out differently, so the possibilities are endless! I also took a daylight photo, just 'cause, and also because I saw how the shimmer came out beautifully in this lighting. Then, as if this polish wasn't perfect enough, I tried layering it over a light color, to see how it would hold up then. Here you see Phantasmagoric layered over OPI Gargantuan Green Grape (yes, I am quickly becoming an OPI whore) that has a light mint green color. What surprised me most about this layering combo, and I do mean surprised in a very very good way, was that there was no streakiness or weird bald patches. I have that problem with certain duochromes that are better layered over a dark color, because they don't make a nice even coat over light colors. No problem for this fantabulous polish, no way! The light green color makes the purple less obvious, and the blue comes out perfectly and sparkly. Phantasmagoric would look awesome over any green, blue or purple color! That concludes my review of the Northern Star Halloween collection! Don't forget to check out part 1 of my review as well! To recap: Phantasmagoric is my very favorite of these five polishes, but I think that's obvious by now! I experienced no application problems with the polishes whatsoever, they were smooth, shiny, self-leveling and non-bubbling. The Northern Star Halloween collection will be released on September 15th at noon Central time. Full sized polishes are 15ml/0.5 oz and cost $8,50 and minis come in 9ml/0.3 oz size and are sold for $5,50 per bottle. They will be available in the Northern Star Etsy shop, you can also follow this brand on Facebook and Instagram to keep up with news, restocks and sales! I had a blast playing with these polishes! Thank you Kristin, for sharing your passion with us!